Hail fellow musicians. 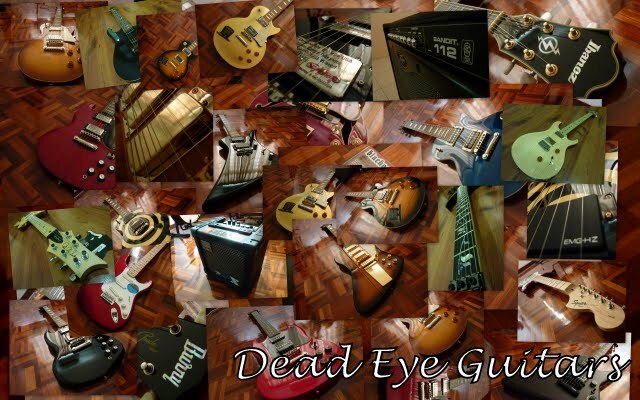 DeadEyeGuitars.Blogspot.com is a Malaysian Online Musical Sales Blog, where local musicians can purchase their musical instruments such as Guitars, Bass, Drums, Keyboards, Amplifiers and MORE. Why purchase from DeadEye? Well, we offer goods which are genuine and gurrantee satisfaction. Not to mention, better prices are offered as well! Oh, not to miss out, we accept CASH and CREDIT CARD!! Found a cheaper price of a same product? Just let us know, and we will do the trick and make sure you're way satisfied! Do add our facebook page! - Delay may occur during transporting process, so do state if products are needed urgently to avoid misunderstanding issues. - Balance are paid when collecting the product (For CASH ON DELIVERY (COD) transactions). I would like to thank all, for those who had purchased from me. Your support are much appreciated! ever thought of selling the stuff at ebay? got difficulties to buy music instrument because this things are so expensive here..you provide nice product and nice price..i like it!! thanks for the support bro!! Hmm, so do u post the item we bought to our house address or we must me see you to collect it? i would like to buy epiphone sg (red) by credit card.so how? how much is the cost and any discount? i'm from alor setar kedah. hey man! i've been checking in the website for days now im very interested in buying an epiphone sg or lp and i just wanna ask how much for the sg-400 and les paul standard. A suggestion is try to find a Sg-x coral or any color is a really good guitar ! :) cheers man! haha, this guy sell guitar from planet Pluto. all guitar at reasonable price! wtf... JACKSON demelition v Price`s under RM 2000???? impossible man... From which county did they made??? It is genuine? the one under RM2000 is the Jackson PDX demillition V, which falls under the Jackson X series, not the PRO series which i assume u are reffering to. last question bro. mane lg okay? what das the RM mean in the price? Bro... Still no news for Mandobird IV?? can you bring or not?? No news on Mandobird IV?? can bring in or not?? Any extra charges if using credit card..?? Sorry for being out of topic but is it true there's a way to change your guitar colour? Air-brush or something like it. If it's true what are the effects on the guitar? Guitar Burny tu elok ke? Brapa harga ltd ec 401 dan ltd wa 200 black camo sekali dengan kos penghantaran ke alor setar? bro , how to pay when using credit card to pay ?? u have shop or..... ?? hye bro:> want to know if there any ibanez rgt6-ex on stock and how is the price? thanx. hello bro!! :D hey,how much for the orange tiny terror combo? is it 15watt output, rite? bro Ibanez RG7321 tu tkde free gift ker?kabel ke,strap ke...? bro, i'm sort of interested in ur rgr321ex, is it still available? plus can u pm me ur best price. thanx. Hi bro, yamaha0 p85 available? email me your best price. hey bro, yeah i do sell the IBANEZ ICEMAN guitar, mainly the IC400 and the ICT700. which one are u referring to bro? would like to get one . Thanks . Hi, already e-mail you with regards to the sham kamikaze . Thanks for your help . hey how do i made the payment using cash?and if im at sarawak or sabah how is the shipping then? tq, Bro...glade to hear tat. bro.. sory if double posting..
email me the info bro ..
Hey, do you deliver in sg? great, can email me the price for the Ibanez GRGA22FM? price for Jackson PDX Demmelition King V and LTD mh-100 qm. can email me? Yo dude, do you have the ESP LTD MH-350NT? for jackson guitars, which is more expensive? usa select series or pro series? hi can email me the price for Dean VMNTX United Abominations guitar cos rly like it. hi bro,do you know how much for the Ibanez Jemini Distortion pedal? bro,the Epiphone Les Paul Custom Black guitar still available..?I'm from penang..so how do we deal..? hey you got epiphone les paul studio? Hey,,do u hav LTD Viper-1000 Deluxe white with seymore duncan? ?and how it cost..? n any guitar that hav same spec like that? I mean same satisfaction when playing it..hehe..
n can u tell me the chepest n great les paul that I can get n its price? anyway,,do you hav b.c rich mockingbird guitar? it is mockingbird pro x series..
also fender black top series?? do u hav any of it? Hey, I am interested in purchasing a bass, what would be the recommendation for my budget? it's rm1000~rm1700. I was eyeing the Yamaha RBX374, how much would that cost? hey.can u let me know the price for epiphone delonge es333? Epiphone dot berapa boleh dapat? hitam atau natural. hey man! !do you ship to greece?? and whats the price for the esp ltd ec50?? anonymous: hi there. yeah i do ship to greece :D u got the price emailed! Hey I'm interested in IBANEZ RG350DX. How much is it for? credit card will be extra charges? Do you have stocks of any schecter synyster standard,custom or schecter zacky vengence? Hello bro.nak tanya kamu ada jual Ibanez XP300 Electric Guitar dan Ibanez ICB200EX Iceman Extreme 4-String Electric Bass ?? berapa harga termasuk postage ke Sabah for each item. Plz reply ASAP ok..Cheers from Sabahan Metaller !!! do you have any Agile guitar?? hi there... just wondering.. how much for the Gibson Les Paul Standard Ebony? bro...what is the price for the cheapest guitar ??? bro.. I'm very interested in Michael Kelly Patriot Shadow guitar. what's the price bro? my email semput@gmail.com.. thanks..
Dear all, dead eye Guitars didn't promise the goods delivery !! bare with me!!! who is this anonymous try to blackened dead eye?? bro, do u deal amps? I'm looking for Roland Cube 15XL OR 20XL. do u have it and if so can u email me the price? hi there do you sell epiphone speacial ii player pack? if so wats the price? really,ok2...can u email me wat model u got for 6 string,with price..im looking for ibanez SR5006E prestige or SR5006...if u got another brand,pls info me..
my budget around 3k to 4k..
Bro, do you have any electric guitar starter packs for beginners? Pls email me the details and price, thx. bro i was just wondering if you could tell me the price for Deluxe Players Strat, Maple Fretboard , Honey Blonde. and the price range, thx. Bro, do you have any left handed guitars for sale? bro do you have the peavey bandit 65 instead of 112? and how much is the envoy 110? Do you have an orange pix 35ldx in stock? best price please. email to jtchan78@gmail.com Thanks!